Food is a huge part of who we are, from our first solid food as babies to our favorite foods savored over the many decades of our adult lives. Food is a crucial part of our communities and how we connect to one another. And food can also help us have as many years as possible to do lovely things like gather around the dinner table together. Nutrition for older adults is critical. While it is the same applies for all ages, it becomes especially important for seniors who want to get the most out of their golden years. 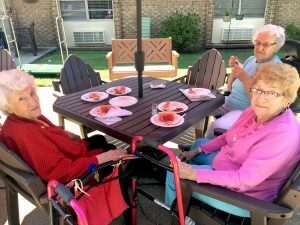 Senior living communities like Regency of Tuscaloosa make it easy to eat right, and to enjoy time together with friends and neighbors at mealtimes. Our executive chef takes pride in creating well-rounded meals featuring fresh vegetables, local ingredients, lean protein, and a variety of flavors that will not only satisfy your tastebuds but get you all the macronutrients you need to feel your best. If your doctor recommends any particular dietary restrictions, we can work with you to help you achieve your dietary goals and maintain optimal health. Another big part of healthy for seniors isn’t just the quality of the ingredients and making sure to get all the food groups in proper proportion, but also eating the right amount of food at each meal. As we age, our metabolisms slow down, meaning we don’t need as many calories to stay at a healthy weight and feel satisfied. That can take some adjustment, however, if you’re appetite is used to decades of eating bigger meals with more fat, salt, and calories. Many chronic health conditions benefit from increasing protein intake and reducing refined carbs, but some conditions like liver disease have other nutritional requirements. Or medications for some diseases and symptoms react badly to certain foods—it can be dangerous to eat foods high in Vitamin K, for example, if you are on certain blood thinners. Talk to your physician about what the best way to eat might be for your unique combination of health conditions and medications. With a mindful approach and a skilled culinary team, it’s less daunting to make the kind of shifts to your eating habits that will leave you feeling younger and healthier. Imagine how much easier and more enjoyable all sorts of activities will be if you’re at your healthiest, from Tai Chi Class to bean bag toss. And there’s always room for the occasional treat, like snow cones on the patio and outings to enjoy shopping and lunch in beautiful downtown Tuscaloosa. After all, healthy eating as much about balance, and spending quality time together around the table as it is about carbs, protein, and vitamins.